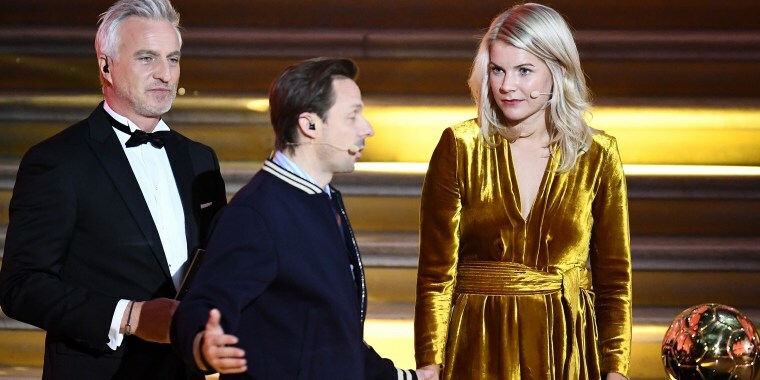 Moments after Norwegian soccer star Ada Hegerberg was honored Monday in Paris as the first female winner of the Ballon d'Or — a major soccer award — a co-host of the ceremony asked Hegerberg if she knew how to twerk. Hegerberg, 23, responded with a "no" while looking uncomfortable onstage. The awkward exchange has led to backlash on social media and an apology from the co-host, Martin Solveig. Hegerberg — who ended up dancing with Solveig, a French DJ, to a Frank Sinatra song for a few seconds — told reporters after the ceremony that Solveig "came to me after and was really sad that it went that way. I didn't think about it at that moment. I didn't consider it as sexual harassment or anything." Still, a number of people took to Twitter to ridicule Solveig's remark, including actor Hugh Grant. Tennis star Andy Murray posted on Instagram, "(T)o everyone who thinks people are overreacting and it was just a joke. It wasn't. I've been involved in sport my whole life and the level of sexism is unreal." Solveig issued an apology on Twitter, stating, "Sincere apologies to the one I may have offended. My point was: I don't invite women to twerk but dance on a Sinatra song. Watch the full sequence People who have followed me for 20 years know how respectful I am especially with women." He later posted a statement in which he said, "I acknowledge that it was in poor taste and I am deeply sorry for my mistake." Hegerberg, who plays for the Norwegian national team as well as a French club, doesn't seem to be letting the fallout from the "sequence" get to her. She posted a photo of herself with her award, captioning it, "WHAT A NIGHT." During her acceptance speech, she noted that her win was "a huge step for women’s football" and that she hopes it inspires young girls.